Soft-firm – interesting game a task for children of youngerpreschool age. In the course of games children constantly learnsomething new about objects and their properties. They areinterested in everything that surrounds them, and try to learn andstudy as much as possible all new. Therefore it is worth paying asmuch as possible attention to development of thinking of the child.One of occupations with children is search of distinctions betweenobjects. Already just playing with the toys, the child learns todistinguish them by the size, weight, color and a form.The traininggames "Soft Firm" the kid should get acquainted with suchproperties of objects as softness and hardness. Soft objects it issuch which cave in from pressing them. Firm objects it is suchwhich do not change the form when pressing. With the game "SoftFirm" the child will be able to learn to determine softness orhardness of objects not only to the touch, but also by images ofthese objects.At each level of game the question will be set: "Whatis firmer?" or "What is softer? ", and to be given two images amongwhich it is necessary to choose the correct answer. Willinterestingly play game throughout a long time as couples of imagesalways change. Also, during game pleasant music, and commentssounds. "Puzzles for adults represent fascinating game - a puzzle in whichit is necessary to collect the puzzles consisting of a large numberof pieces of one image. Classical puzzles, with an opportunity longand fascinatingly to play as parts of the picture in this game 56.They need to be collected in one big beautiful puzzle.At this gamethere are big pictures with images of the cities, evening cities,fires, embankments. Puzzles of the city will be interesting notonly to adults, but also children. Beautiful landscapes ofembankments and fires of the evening city in beams of a declinewill give you pleasure from game.That these new puzzles for adultscontain:- It is a lot of parts of one big image;- Quiet romanticaccompanying music;- An opportunity to turn on or turn off thebackground hint to the picture;The hint in the form of thebackground picture turns on by pressing a bulb.The hint allows tocope more easily with a task and to collect a puzzle. And for fansof high complexity we recommend to turn the hint off .And do youknow that puzzles were invented by John Spilsburi who worked ingeographical society several centuries ago was engaged in creationof maps of Britain. The cartographer sawed plywood with drawing onborders of counties on pieces of which made the map. Such map wasissued in Britain under the name ""The England and Wales MapDivided into Counties"".The author patented the invention andopened shop in which sold maps on wooden plywood. These maps becamea training material on geography.Why to collect puzzles, you ask?It is interesting and fascinating. Game in puzzles allows todevelop motility of hands, attentiveness and assiduity. Adults liketo play puzzles too, especially, when children are very keen on it.However it is not always possible to find puzzles for adults,usually it is children's pictures from children's movies andanimated films which are not always interesting to adults.In thisgame we collected images which will be interesting to people ismore Sr."
If you and your child enjoy puzzles, cars and racing, then thisgame is for you. The game contains colorful puzzle depicting thefamous brands of cars such as Ferrari, Lamborghini, Porshe, BMW andmany others.The game has several levels of difficulty, where youcan choose the number of parts in the picture. From 6 to 30 pieces.Furthermore, it is possible to enable / disable the backgroundhint. That's why the puzzles are liked not only by kids, but alsofor children of any age.The gameplay is accompanied by commentswith a pleasant female voice, and fun music that can be disabled ifdesired. The game has the ability to select the language.Puzzlesfor Children - is the best entertainment for your child, because itallows to develop the motor skills of hands and attention. Puzzleshelp develop imagination and thinking of the kid.When the puzzle isassembled, you have a pleasant and fun surprise. Have a good game! Our puzzle for kids contain pictures of various animals and birds.Bright multi-colored parrots, smiling frogs and even a dog with anumbrella! The gameplay is accompanied by a children's merrymelodies and sounds. When the kid collects puzzles correctly, he’spraised: you’re smart, good job, etc. A pleasant female voicecomments events in the game and helps the child to contact with thegame. The main character is the cat, which is actually the one, whocomments. There are several levels of difficulty: 6 pieces -puzzles for children up to 3 years, 20 pieces - puzzles forchildren at the age of 3-4 years, and most difficult level -puzzles without tips - for children older than 4 years and adults.Therefore, these puzzles are not just for kids, but also for adults- puzzles, which you can solve with your child. "If you love to collect puzzles, but in the games directory couldnot find a large puzzle, which consist of a large number of imageslices, then congratulations, because you have already found them!You will enjoy this game, especially since you can download puzzlesand play them without an internet connection. This time Sbitsoftoffers to play in the puzzle for adults. The puzzles, where a lotof pictures. Image contain puzzles castles, which will beinteresting for adults.For larger puzzles are selected pictures ofthe world famous castles, palaces and monuments. These photos arethe most appropriate for the game puzzles for adults. Probably eachof us wants to travel to distant lands, and maybe even in the past,in times of brave knights and beautiful princesses. Plunge into theworld of historical adventure - collect all the pictures, admirethe beauty of medieval castles.Puzzles include images 100 medievalcastles and palaces. Each image consists of 56 elements.The gamehas a turn-on tips - when the board takes on the contours, and theblocks - the mark of the desired image." "It is fascinating and interesting to play an interesting puzzleabout fruit! We create games with love of children therefore eachgame takes place high-quality selection and the test, these gamesare played by our children, these games are recommended also toyou.In puzzles ""Fruit"" you need to collect 45 pictures on whichfruit are represented. It is fascinating, especially, when the modeof game can be complicated, having chosen a session not on 6pieces, and puzzles on 20 and 30 small pieces of one big image.Game process accompanies a pleasant female voice which prompts tothe player when that does the correct or wrong actions. When thepuzzle is built there are balloons flying on the background whichis possible to burst with pleasure and dexterity, pressing them.Inthis puzzle on gathering fruit there is an opportunity to includethe game mode with the hint. It is when a background contour joinswith the image that allows to find more easily the right place forthe following piece of the picture.During game sounds music whichif necessary can be turned off. Music - the pleasant and cheerfulsong with which to play puzzles, gathering fruit, even morefunny.In game it is possible not only to gather fruit, but also tolearn them, to learn what there are fruit. Game is developing, itpromotes improvement of coordination of movements, development ofattentiveness and trains motility of hands.We have not only puzzlesfruit, but also puzzles for adults which you can find in similargames from our company. Thank you for the choice!" Dear girls and boys of any age and even of three years, we hurry toshare with you new fascinating game which consists of differentanimation puzzles and fascinating entertainments.Subject of today'sgame - flowers. They surround us everywhere, and not just areevident, and bring joy, pleasantly smell and even symbolize love.On the discretion choose one of available drawings that by means ofthe erudition to solve an interesting puzzle in the form of apuzzle.Pleasant surprise for you will be the fact that after asuccessful completion of assembly, on the game screen there will becolor flying balls which it is possible and it is necessary toburst a finger. Quickly press to break all of them.The brightgraphics, is a lot of various flowers and a fascinating gameplayfor a long time will present you fantastic mood. The most part of the planet Earth is covered with water. We callsit the seas and oceans. If people can live only on the land, thenunder water more than 30 000 sea inhabitants with whom we want toacquaint you with the help of our game puzzles live.Here you willmeet cheerful fishes, the amusing sea horseman, a jellyfish andeven a magic goldfish who can execute any desire.We broughttogether for you unique animals in the look that you could spendwith pleasure the time together with them, solving puzzles.Chooseone of nine submitted pictures photos to collect it by means ofsmall pieces. Complexity of game changes at any time depending onyour desires and preferences. Three modes are presented: on 6, 20and 30 pieces. If you love difficult games, press the magic button"Clean a Grid" not to see the hint on the game screen: it will beso more difficult, but even much more interestingly.Have fun andhave a good time, playing our puzzles for children of any age. Do not miss this wonderful and colorful game for children andadults. Puzzle palaces and castles - isn't it a godsend for fans tocollect puzzles.In the pleasant atmosphere of the middle agesfollow a knight's path, visiting the beautiful castles and palacesof the world. Immerse yourself in the medieval atmosphere, feellike a real knight who captures castles and expanding yourEmpire.The game offers you:- More than 40 castles;Soundtrack -melodies and a pleasant female voice;- Select levels ofdifficulty;- Tip;- Colorful and high quality image;Play puzzlescastles are very interesting. It's not just to look at the photosof palaces and castles. But also to guess them, folding of smallpieces.The game will be interesting not only to kids but also tothe elder children. Well, who hasn't imagined themselves inchildhood the brave knight who rescues princesses and fightsdragons and defeats them.This time your task is to collect all theimages and beat the game. After the collection of each puzzle youwill find a nice secret surprise, which you'll learn during thegame.Puzzle palaces offer several difficulty levels, the ability toenable and disable sound, as well as to use hints. Fun and educational games for toddlers and kids. Ages 18 months andup! Great for preschool and kindergarten aged kids 20 games in one!Colorful graphics, animal sound effects, helpful voice narrating,and lots of fun! Have your kids learn counting, shapes, colors, andthe alphabet while being entertained! Perfect for preschool andkindergarten ages. Includes two games games for free. Unlock all 20through a simple in-app purchase: Fun Games: - Tap Farm: Fun animalsounds and animations at the farm, including cows, dogs, pigs, cat,and more - Tap Zoo: More animal sounds and animations at the zoo,including elephants, bears, lions, monkeys, and more - Tap Ocean:Interact with playful and interesting ocean life, make them swim,play, do flips, or more! - Shapes and Colors: Learn shapes andcolors with helpful voice narration, a requirement for kindergarden- Alphabet Bounce: Teach your kids the alphabet with colorfulbouncing balls, the first step towards reading - Farm Puzzles: Dragand drop animals to construct fun farm puzzles - Two StepDirections: Help your toddler learn to listen better and followmulti-step directions - Categories: Learn to group similar objectsinto categories, an important kindergarden skill - Balloon Burst:Great for hand eye coordination and keeping kids entertained -Animal Find: Help kids identify animals and their sounds - CountingJumble: Help with counting to 10, important for preschool andkindergarten - What's Missing: Help your toddler pay attention andnotice things that are missing - Animal Memory: Improve memory inthis matching game for children - Number Order: Go beyond countingby learning what comes before and after each number - FruitSlingshot: Just plain fun for toddlers and kids - Shadow Matching:Improve your child's critical thinking by identifying a shadow andoutline - Toy Box Numbers: Helps kids learn numbers and countingwhile putting toys away - Butterfly Catch: Have fun catchingcolorful butterflies while improving color recognition - Color andSize Sorting: Children follow directions and identify differentsizes and colors - Alphabet and Number Bingo: Helpful voices callout numbers and letters to identify, important math and readingskills! Advanced Features in the Full Version Include: - DetailedProgress Reports to help track your child's development - LessonBuilder to create specific plans for your toddler to follow andplay - Multiple User support so up to 6 kids can play on the sameapp - Avatars, stickers, and backgrounds for your toddler to unlockas they learn Perfect for kids, children, and toddlers who need afun and entertaining educational game to play. Great for kidsentering preschool or kindergarten! If you're having any troublewith our games, please email us at [email protected] and we'll getback to you ASAP. And if you and your preschool kids love the gamesthen be sure to leave us a review, it really helps us out! More than 4 million downloads! EduKidsRoom is played in akindergarten child’s room filled with a variety of educationalobjects. Amazing puzzles, games and quizzes for toddler andpreschoolers to learn colors, shapes, numbers, letters, time,organization and more! Now Play in 12 Languages: English, Spanish,Arabic, Russian, Persian, French, German, Chinese, Korean,Japanese, Portuguese.Games and Activities:•Match Pairs-Kids learnto match pairs of similar objects based on their color andpatterns.•Learn Colors- Kids learn colors and their names byplaying different fun mini games.•Learn Geometric Shapes- Kidslearn geometric shapes and their names by solving shapepuzzles.•Train Puzzle- Amazing wood puzzle to build a train.•RobotPuzzle-Amazing wood puzzle to make 3 different colorfulrobots.•Xylophone Puzzle- Wood xylophone puzzle with sounds. Kidslearn about sounds, music and music notes.•Clock Puzzle- 2 minigames to build a clock and tell the time.•Learn Numbers andCounting- kindergarten kids learn numbers and number names andcounting from 0-10.•Learn Math- Kids learn basic mathskills.•Alphabet Memory and Letter Phonics- Fun interactive memorygame for preschool kids to match the alphabet letters and learntheir ABC sounds from A-Z.•Sorting and Classifying- Kids learnabout object organization by playing a fun mini game.•Categorizingand Organizing - Kids learn categorizing by playing a fun minigame.Features:•16 Different Unique Educational Kindergarten Gamesand Quizzes!•Two Different Skill Levels, Easy (2-3 Years Old),Normal (3-5 Years Old)!•Instructional voice commands in 12Different languages, preschool kids can playindependently!•Customizable!•3D HD Colorful Graphics!•Two AdorableAnimated 3D Characters Guide Preschool Children In Their LearningProcess!•Unlimited Play and Innovative Rewards System! * Babies game for 1,2,3 years old. * 10 Educational puzzles to play& learn first words. 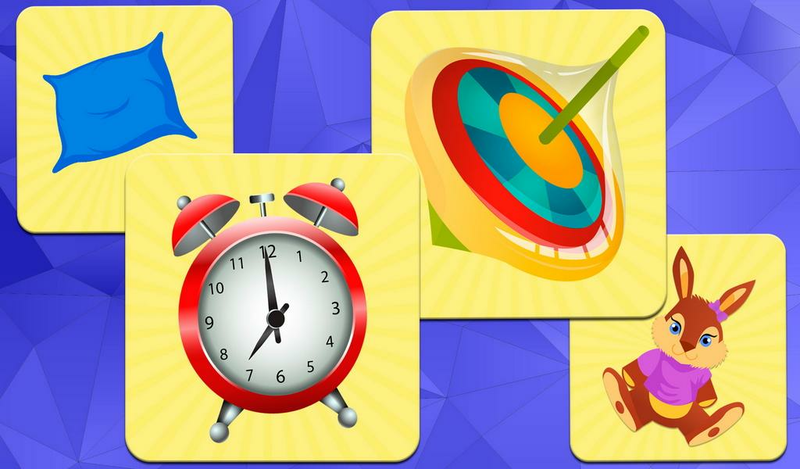 * First 4 puzzles are FREE, others areoffered now at a special priceGame didactic goals:- Help curiouskids expand their vocabulary and learn new words.- Learn aboutshapes and colors with 10 mini games.- Teach toddlers how to nameShapes, Colors, Animals and more.Playing examples:* In the Colorspuzzle, your baby will learn to distinguish between differentcolors such as “Red” & “Yellow”. * In the Shapes puzzle, thebaby can match cards with different shapes and learn to pronouncewords such as Square and Rectangle. * In the Animals puzzle, curiousinfants will enjoy looking at the lovely animals illustrations andexpand their vocabulary with words like: Mouse, Monkey andFish.Features:- Easy and intuitive - even infants can play thepuzzles.- Safe environment for children. No ads, No pop ups.-"Voice over" feature (can be turned off - just touch the mouthbutton).- Fun animations for your little child’s enjoyment .-Special launching price offer.- includes 10 boards (mini games). 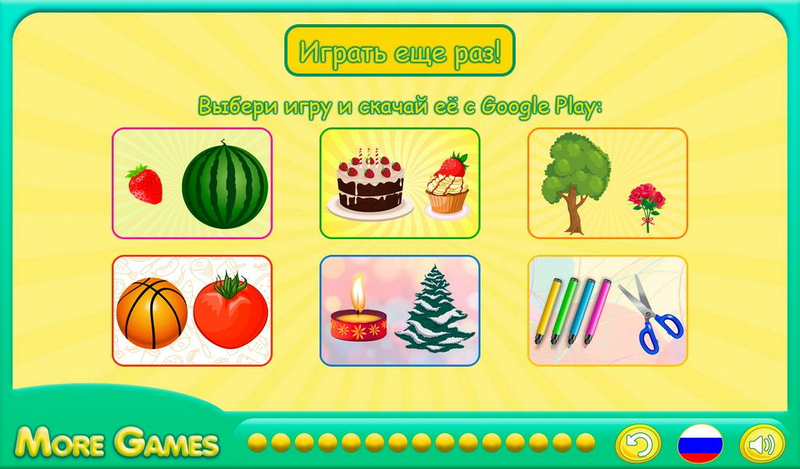 Educational games for kids Kindergarten learning free apps &Fine motor skills games became fun! A world of 15 learning kidsgames! Learning games for toddlers age 3 5 with smart baby shapesaddress various topics such as: geometric shapes, colors, logic,sizes, etc! 🤗 🎓 Welcome to the world of 15 various children gamesin Funny Food 2! 🍒 Funny Food 2: 🍐 🍏 PUZZLES - sort out the jumbledfunny foods (Fun learning games for kids 5 years free); 🍕 ANGLES,PARTS & WHOLES - cook and slice pizza and then feed cutecharacters; 🛒 FIND & TAP - sort foods into their appropriateplastic bags (Children’s games for 3 to 5 yrs old, that developsattention); 🤔 HIDE & SEEK - find the rascals and count them(Games for children free that develop attention; learn to countfrom 1 to 5); 🍋🚿 SHAPES - water the magical garden, growvegetables, then harvest and count them; 🚁SIZES - sort food by sizeand load them to the helicopter (Introduces a concept of sorting bysize for smart kids free); 🍐🤓 LOGIC - find a pattern and arrangefoods correctly in the tractor's trailer (Kindergarten games freefor 5 year old, that introduces to a concept of consistency andcontinuity); 🚛 SORTING - sort all foods from the conveyor belt intodifferent pickup trucks (develop attention and logical thinking); 🍒MATCHING - find all the matching pairs (matching games free forkids, attention); 🍉🍴 UNITS & PARTS - slice the foods by tracingthe lines and cook various dishes (Memory matching games for kidsfree); 👠👒👓 CREATIVITY - dress foods in fancy clothing (2 year oldgames free boys develop creativity and imagination); 🍋 LEARN SHAPESAND COLORS - prepare cookies that differ in color and shape(Introduces to sizes); 🍏🐼 COUNTING from 1 to 5 - feed animals withthe right amount of food (A kind of puzzle games for kids 5 yearsfree that help learn counting and think through math); ⚖️COMPARISON - use the scale to weigh the right amount of food; 🍓🚰COLORS FOR TODDLERS - kindergarten games free for 5 year old: washfruits and vegetables under the shower and sort them by color. 💥FEATURES: 💥 🍒 15 baby learning games for kindergarten and above inEnglish; 🍏 Fun sound effects and amazing graphics, free games fortoddlers; 🍇 Amusing characters with lots of animation andinteraction; 🍊 Simple interface like in learning games forkindergarten; 🍓 Basic skills in learning kids games for children 34 yrs free: logic, attention and thinking for kids to think throughmath; 🍐 Parental control; 🤓Explore smart kids games: think throughmath, fine motor skills games! Totally kindergarten learning freeapps! Keep your child busy with educational games for kids! 🌟AboutMAGE:🌟 😍These educational apps for toddlers have been created byMAGE, who develops interactive children learning games for toddlersage 3 to 6. 🤗 With our educational games child will learn thealphabet, letters, numbers and phonics. Our games for preschoolerscomply with the standards of “Designed For Family”. 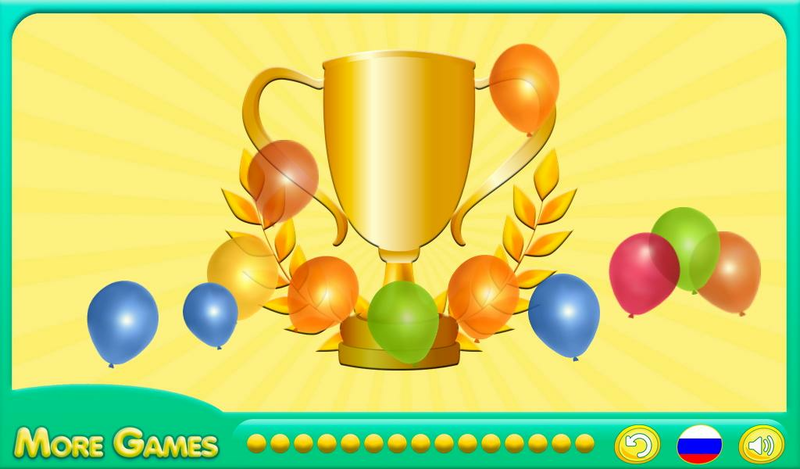 Kids puzzles is an educational game for kids and toddlers ages 1 to5. It will help toddlers to develop such basic skills as finemotor, attentiveness, coordination and visual perception. Kidspuzzles is not just another puzzle game for kids – beforecollecting puzzles babies will be able to color the animal withmagic brush. After the puzzle is assembled, there will be a cuteanimation that will definitely entertain pre-kindergarten kids. Wehave different toddler puzzle sets: - Animal puzzles - Christmaspuzzles - Fairy tales puzzles - Sweets puzzles - Space puzzles -Sea puzzles About Kids puzzles: - Kids game for toddlers ages 1 to5 - Puzzles for kids to develop logical thinking and coordination -Coloring for kids that will entertain both girls and boys Ages: 1,2, 3, 4 and 5 years old pre-kindergarten and kindergarten kids.Kids puzzles are perfect for children who want to learn by playing.You will never find annoying ads inside our app. We are always gladto receive your feedback and suggestions.